Let’s analyze these certs in your chain. The first one is L1Croot.txt which is called the “root certificate”. This is the first cert in your chain. This root cert is installed to the Trusted Root Certification Authorities store on your server or network appliance. The second cert in your chain is L1Cchain.txt which is “intermediate certificates”. An intermediate cert is essentially a certificate issued by the Trusted Root CA specifically designed to issue SSL Certificates to you. The reason for this is because if the CA root cert were to ever be compromised, the entire chain fails. 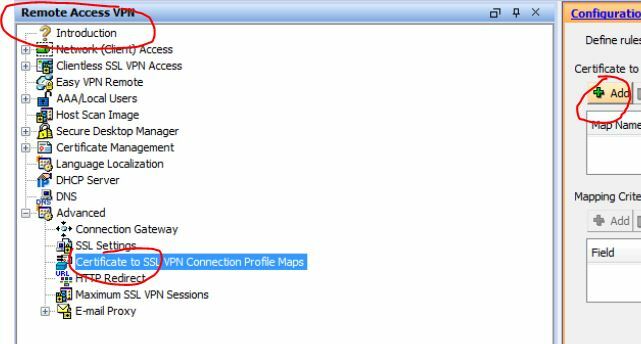 It is good security practice to use an “intermediary” to issue the certs from to prevent your root CAs from being exposed from the signing process. If an intermediate were to ever be compromised, you can always regenerate those unlike the root certs. This intermediate certificate sits between your website cert and the root cert. This intermediate cert is installed to the Intermediate Certification Authorities store on your server or appliance. The last cert in your chain is entrustceert.crt which is your actual SSL cert. This is also known as your “domain certificate”. This domain cert is installed to the Personal store on your server or appliance. So the end result is chain of certs that begins at the trusted root CA, runs through the intermediary, and finally ends with the SSL certificate issued to you for your website or appliance (domain.com). 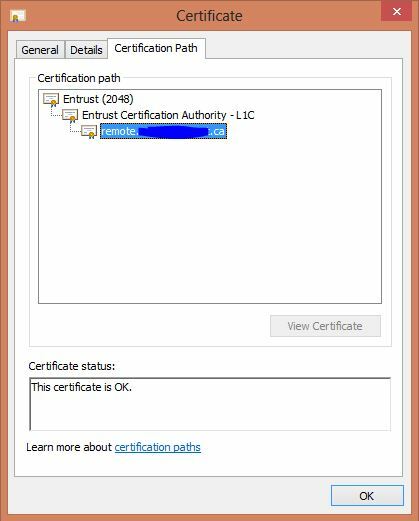 In most cases, any sever or appliance out there will already have the trusted root cert for Entrust installed. You can just install your SSL cert and not have to worry about anything else in most cases. Depending on where you buy your cert from and what you are trying to install your cert to, you may have to go through the steps of installing the Trusted Root cert and Intermediate cert first before installing your SSL cert. With some web browsers like Internet Explorer 7 for example, you can get away with not having to install any Intermediate Certificate because IE7 will automatically go out automatically download the intermediate cert the first time a user visits your website. This makes things easy for the lazy admin but it’s always best practice to go a head and add the Intermediate cert on your end instead of depending on the client and their browser’s ability to do this. 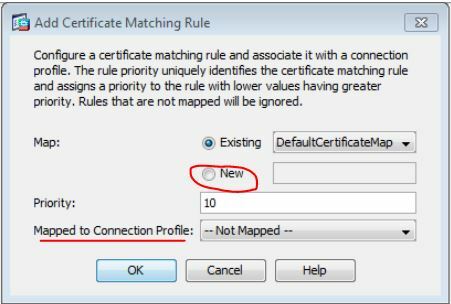 There is no point in risking a certificate error for the end user when the fix is so easy. You can then click on each one of these certs and hit the “View Cert” button to view each cert in the chain individually. Good luck and post a comment if you have any questions. 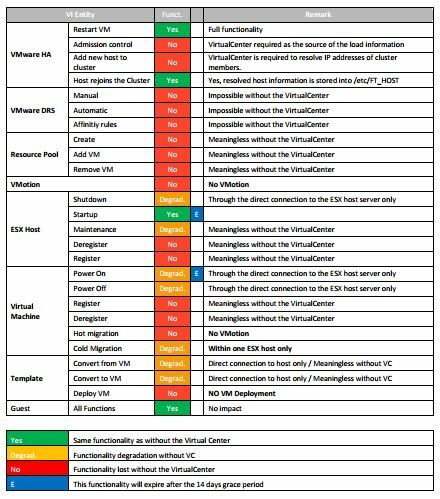 Seva, a VMware Technical Account Manager, put together a cool table with the implications of a VirtualCenter crash. Click the image for the pdf file. The most important thing to remember is that the VM’s keep running whatever happens to your VC Server and HA will still work if VC fails.